In America, you can be wronged by the courts, then….jailed for telling anyone about it. Please share Sharon’s story widely and join us with Lawless America in our efforts to expose and STOP judicial corruption! In the writing, Mr. Davis linked to the video of his recent ONE HOUR INTERVIEW of Sharon Noonan Kramer. In a 2005 writing, Sharon exposed who was involved in mass marketing the false concept into U.S. public health policy that it was scientifically proven water damaged, moldy buildings do not harm people. Giving false credibility to the scientific fraud was for the purpose of misleading U.S. courts to deny financial responsibility for causation of the environmental illnesses. Leading officers of the California courts framed Mrs. Kramer for libel for the words “altered his under oath statements” in the writing by making it appear in their opinions to have made a false accusation that the writing did not make. They suppressed the evidence that the plaintiff, Bruce J. Kelman PhD, committed perjury to establish a character assassinating, false light theme for Mrs. Kramer’s alleged malice; thereby willfully aiding the science fraud to continue in policy and U.S. courts by wrongfully discrediting Mrs. Kramer’s credibility and leaving Mr. Kelman’s credibility wrongfully in tact. Additionally, they suppressed the evidence that retired U.S. Assistant Surgeon General, Bryan D. Hardin PhD, who is also a retired Deputy Director of CDC NIOSH and a co-owner of Veritox, Inc., was an undisclosed party to the litigation; thereby concealing the federal government’s connection in the deception in policy, in the courts and in the demeaning of Mrs. Kramer. 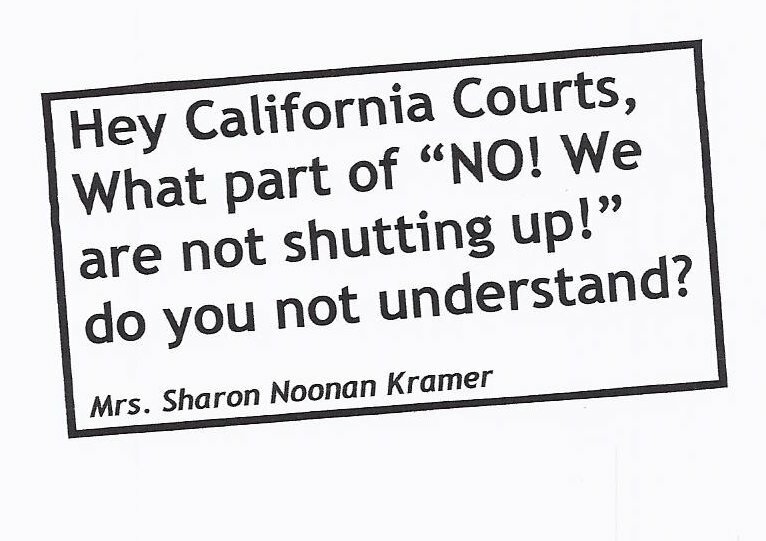 In March of 2012 in an attempt to intimidate Mrs. Kramer into silence to conceal what they had done to her and the continued damage to the public from their collusive misconduct; the California courts put Mrs. Kramer in jail for her refusal to be coerced into signing a false confession of being guilty of libel with actual malice. The Sheriff Department record was falsified by the court to conceal their unlawful acts of jailing a citizen for refusal to commit perjury and remains libelously falsified to this day. The owner of a 2900 member online group for the environmentally injured, Sickbuildings Yahoo Support, had submitted a declaration to the court stating the evidence of their misconduct and the continued harm to the public will not be coming off of the Internet, as the California courts were maliciously trying to force. Crystal Stuckey, owner of Katy’s Exposure Blog, submitted a declation informing them of the same. The games play on in the California courts as they do in Washington D.C. with the safety of thousands, including Hurricane Sandy victims, hanging in the balance. Please watch Mr. Davis’s October 2012 ONE HOUR INTERVIEW of Mrs. Kramer for Lawless America and Citizens Demanding Justice. Then share this blog far and wide. Help us STOP! corrupt officers of the courts from harming more U.S. citizens by aiding to conceal frauds and conceal their roles in aiding them. Thank you for your help in bring this information to public light. This entry was posted in Civil Justice, Environmental Health Threats, Fourth District Division One Appellate Court, Health - Medical - Science, Mold and Politics, Mold Litigation, Toxic Mold, US Chamber of Commerce and tagged acoem, CDC NIOSH, Citizens Demanding Justice, Crystal Stuckey, fourth district division one appellate court, hurricane sandy, Lawless America, Mold, Sharon Kramer, US Chamber, Veritox. Bookmark the permalink.